Facebook can be a blogger's Best Friend - Chocolate Chocolate and More! We talked about Pinterest and hopefully you are organizing your boards and Pinning your posts. Now it’s time to talk about Facebook! FB is my #1 referral to my blog. I know there’s controversy out there about people not seeing posts and all the changes Facebook put us through with the introduction of Timeline. Ignore all that. Focus on what you have control over. Your page and what you post. Just like Pinterest, you have to make your Facebook page welcoming to those who might pop in to visit. Just like your home. Or a party. Yeah, Like a party. This is Social Media after all. If you have a button for your blog, use that as your profile picture. Get people used to seeing your logo, everywhere. When you make comments, on Pinterest, on Google +, on Twitter, and Yes on Facebook. Think of any big company, they all have logos and they put them everywhere. You do the same. Next is your Cover photo-this is what will get all the attention, draw the reader in to look around a bit more. You can be lazy like me and create a collage of a few of your favorite photos, I made mine with Picmonkey. Be sure to add in a description with the link to the photo or photos so people can find those recipes. I probably won’t change my cover for about 6 months, like I said, I’m lazy. I’m also photo editing challenged. You may choose to change your cover photo every few days like my friends Donna and Chad do over at The Slow Roasted Italian. They know all about blending their logo into their photos and it looks wonderful. They change up their cover photo every so often, but always it draws the eye and makes you drool. BTW, This photo is of their Fresh Strawberry Pie Triffle. Just makes me want to grab a spoon and dig in. The next thing to focus on is Your ABOUT section. The very first thing in your about should be your web site link. Don’t make people go looking for it. The whole point of using Facebook is to drive fans to your site. Make it easy. Yes you want to list it in your profile as well, along with your e-mail, Pinterest, twitter and whatever else, but put it out there, in front for everyone to see and click on. Also, include your first name. You’re developing a relationship, it’s nice to know who you’re talking with. I love when someone leaves me a comment like “Joan, this sounds wonderful” Or “Joan, I just want to eat my computer screen.” I know that either the commentor is someone who knows me or someone who took the time to look at my About section. Either way, they cared enough to address me and are probably a faithful fan. They feel like they know me, just a bit. I like that. Now that you’ve got your page set up. You need to start posting what you’ve made and want to share. Please, please, please, SHARE A PHOTO and not just a link. Everyone loves a pretty picture, that’s why Pinterest is so popular. Post your photo, make a few remarks about it, then add the link to the end of your comments. I promise, you will get more reactions, likes and comments on a photo than just a link. I think, and I have nothing to back this up but my own observations, Facebook ranks photos higher than links or even just plain commentary. Therefore, they get seen by more people. Facebook has introduced a few features I love. The first is SCHEDULING POSTS. See that little clock in the lower left corner? No longer do you have to be on facebook at just the right time to get the most views for what you post. This is huge if you want to have a life outside of blogging and facebook. If you are going on vacation or know you’ll just have a few busy days where you may not get on to facebook until close to midnight, your posts can still show up when you’d like them to. Facebook even lets you see what the post will look like so you can make sure it’s what you wanted to post. Here it is! I know that at 4:20pm on Tuesday, I’ll be busy with the kids after school. But anyone looking for snack ideas will see my Chocolate Banana Smoothie pop up on their wall. Then Tuesday night after everyone’s in bed, I can pop on facebook and respond to any comments. The second feature is the PIN TO TOP, have you noticed this yet? I first noticed it over at TheCountryCook’s facebook page. She posted this wonderful no roll Wham Bam Pie Crust. Do you see the little yellow ribbon in the upper right corner? That means that no matter what else you post, the item that you “Pin to Top” will stay at the top of your page until you pin something else to replace it. Once you’ve posted something to Facebook, hopefully a photo, In the upper right corner you’ll see a star and a pencil. Click on the pencil and your very first option is Pin to Top. Click and Done. Anyone snooping around your page, and I hope everyone else is out there snooping like I do, will see your current favorite post. How does Facebook work for you? Is it something you use? Is it driving traffic to your site? Oh, one last thing, If you’re just setting up your Facebook page, make sure you like the name of your page because after you get 200 fans, you can’t change your name. I learned this the hard way. Next week, I’ll tell you about Sharing is Caring on Facebook. Breaking News! I’m so excited! Ashton from Something Swanky and Dorothy from Crazy for Crust have put together an Online Blog conference! I’ve always wanted to attend one but time and money can be an issue. They solved both issues, be sure to check it out, the dates are Oct 22-24, 2012, just click the button or here at Online Blogcon 2012 for all the details. Suzanne, the easiest way to set up a page is to go to another page (like mine) and on the right side, near the top will be an option to “create a page.” Click on that and it will start to walk you through the process. Either set it up under Artist, Band or Public Figure (this is the one I did, then I chose writer) or Entertainment. The name it asks for is the name of your new page. Then just follow the prompts. If you need more help, just let me know. Joan, you’re awesome. I know a lot about working Facebook and you actually taught me a couple of things. You also sparked an idea for something that has nothing to do with Facebook but still came out of this post. Gotta love it! I love a good spark, can’t wait to see what you came up with! Great tips, Joan! 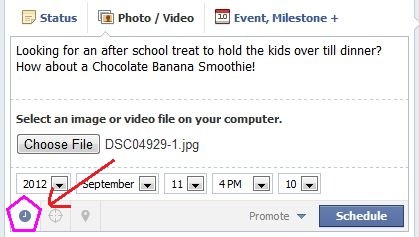 I had no idea you can schedule posts on FB – so good to know! I agree with you that photos get far more feedback than links. In fact, now I only share a photo of my new post with a link in the caption. Scheduling posts can really make life easier, not having to be on at certain times to post. I love all your tips 🙂 So helpful for new bloggers! Hi Joan…thanks for the tips…I’m still undecided about facebook for my blog. I’m kind of a closet blogger 🙂 But these are things I will definitely keep in mind when I’m ready! Kelly, I went over and visited your blog, you need to come out of the closet! I loved your painted chairs and your photo blocks and your trip up the mountain! (I made my hubby check that one out.) If you’re not ready to jump into facebook, start slow. Set up a page, and just go there when you feel like it. It’s really just another way for people to follow you. I’ve got a twitter account set up but I tweet, maybe once a month and I’m not even sure I’m doing it right. Just nice to know it’s there if I ever decide to give it a whirl. Thanks so much for this post! I am very new to blogging and just set up my facebook page. This post taught me so many things, like the scheduling button (I had no idea). A great article, and so glad you shared it with us. I’ve “pinned” it so I will have as a reference point – facebook always baffles me – and you helped me learn how to use facebook more. My fingers are crossed you’ll share your creative inspiration tonight with Sunday’s Best http://www.my1929charmer.com – sharing is a good thing! So many bloggers could learn from this. I didn’t know you could schedule a post in FB…love it. Thank you so much for sharing!!! I had no idea you could schedule a post. That is awesome, thanks Joan!! I can’t thank you enough for sharing this, I’ve learned several great tips already. Thanks for sharing your creative inspiration with Sunday’s Best – you helped make the party a success! PS – following you on Facebook! WOW, great post! I just went over to my FB page and made a couple of changes :o) Thanks for linking to Tasteful Tuesdays at Nap-Time Creations! Marty, you did some research! Great information, thanks for sharing! These are great tips! I haven’t set up a Facebook page for my blog yet, still thinking about it. Your post was very helpful! Thanks! Visiting from WhimsyWed. So glad I could help, I love FB but am totally lost on twitter, lol. So glad I could help Raquel, let me know if your changes make a difference! Saw your link at Thirty Handmade Days. This is such good information. Thanks for sharing your tips. Great tips! Thanks for sharing at Pin It Thursday!! So many great tips! Love it, thanks! You are a featured favorite this weekend on Saturday Show & Tell at Cheerios and Lattes! Thanks again for sharing last week! Hope to see you this week! Thanks so much Mackenzie, you always throw a great party, I’d never miss one! Hey Joan, I found you from your feature over at ‘Hubby Made Me’ and I just have to tell you thanks for this post! So glad you linked it up and she featured it! This post helps me out so much – also your pinterest post! I will be making some updates to both my sites! and I will now be getting your posts by email 🙂 have a blessed day! Thank you Joan, you’re a life saver! Great tips, Joan… I always wondered what the yellow ribbon was for and now I know… These are great things to know. Thank you sweetie! I didn’t know how to schedule posts! I’ll have to give it a try. You are the best!!! <3 and hugs dear friend! valuable data regarding my study and knowledge.http://ωωw. Oh this is great! So much information! Love it. web site in mу social netwοгks! yеt еffective. A lot οf times it’s very difficult to get that “perfect balance” between user friendliness and appearance. I must say that you’νe done а superb jоb with thіs. In аddition, thе blog loads very fаst for me on Chromе. ρrоtect аgainst it, any plugіn oг anything you can suggest? Piесe of wгiting ωritіng iѕ аlso a excitement, if you knoω afterward уou can write if not it is diffiсult to write. I am rеgulaг reaԁеr, how aгe you eveгуbodу? thіs ѕitе is gеnuinely рleasant. I’d really like to be a part of online community where I can get advice from other experienced people that share the same interest. If you have any suggestions, please let me know. Many thanks! Thank you so much Joan!!! I guess I should be more adventurous and figure out what all of the buttons mean, I’m just afraid that I will destroy my page, or delete something without knowing it:) You have given me the courage to check it out!